This kind of headache is experienced as a gnawing, nagging pain over the nasal and sinus areas. It often increases in severity as the day progresses. Fever and discolored mucus may be present. These headaches are caused by allergies, infections, nasal polyps and food allergies. 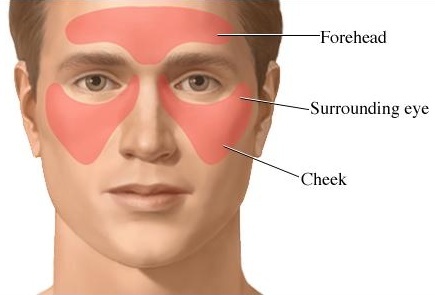 A sinus headache is often caused by blocked sinus ducts or acute sinus infection. Treatment depends upon what is causing the infection. The best approach is to boost your own immune system to stave off infections or reactions to irritants. I suggest you take quercetin, a natural bioflavonoid, that protects your system against allergens and increase the immune systems effectiveness. Bromelain, a plant enzyme derived from the pineapple stem, enhances the effectiveness of quercetin. Take these as directed in the labels they come wrapped in. Increase your vitamin A intake to 10,000 IU daily. This will enhance the immune system and protect against colds, flu, and other infections. It also helps maintain the health of the mucous membranes. Vitamin C complex in doses of 3,000 to 10,000 mg daily, in divided doses, will also boosts the immune function and assist in preventing infection. It, too, deceases the presence of mucous. If you find that a tissue salt will are imbalanced you first should consult a naturopathic doctor and see which tissue salts you will need more of. You may find that Phosphate of Iron may assist you. Use moist heat to help sinuses to drain.